Prepare dough by blending cream cheese and butter until uniform and smooth. Blend in Pioneer® Original Biscuit and Baking Mix until mixture resembles coarse crumbs. Add milk in a slow steady stream while mixing, a soft dough will form. Turn dough out onto a lightly floured surface; knead only 4 to 6 strokes, just enough to bring dough together into a ball. Roll dough out into an 11x17” rectangle; cut to fit on cookie sheet. Cover and refrigerate while preparing filling. Spread cheese filling lengthwise down center of dough in a 3-inch wide strip. 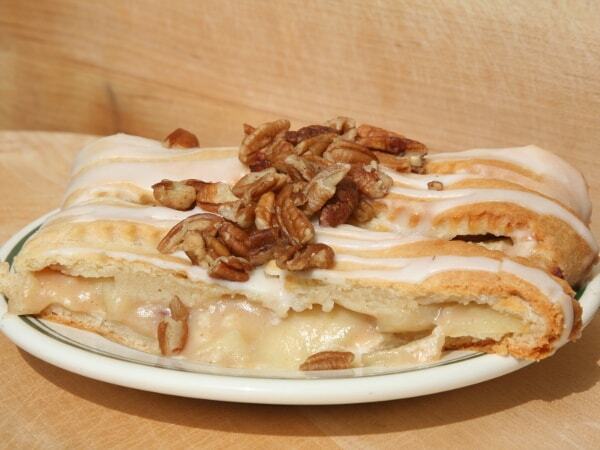 Combine ingredients for apple filling: spoon over cheese filling. Cut 4 1/2” long strips, 1” wide, perpendicular to the filling along each side of dough. Crisscross strips of dough over filling, beginning at one end and working towards the other. Pinch and tuck dough ends under on both ends to seal. Bake 28 to 30 minutes, or until golden brown; remove from oven. Cool pastry completely on cookie sheet. Prepare glaze by blending all ingredients until smooth. 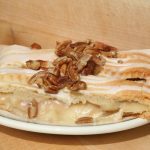 Drizzle glaze over cooled pastry, sprinkle with chopped pecans.